Wine gums, wine gums, wine gums. If you’ve never had them, yer bummed. 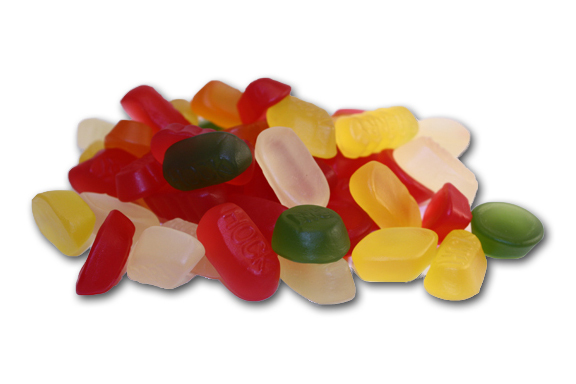 If you have, you know that they’re essentially firmer gummies that hold their origin in the UK. Traditionally flavored as Lime, Lemon, Orange, Raspberry, etc- the most important and defining flavor in this man’s opinion has always been and will always be Black Currant. Not down with Black Currant? I wasn’t either until I was held over in the Heathrow Airport in 2004. Sure, we were aborting a well intentioned but ill-fated Italian vacation early,my wife was pregnant and sleeping like a hobo on the airport floor, and I was broke. But I discovered the candy rack in the Heathrow Airport. Everything changed. Wine gums, wine sours, exotic varieties of Haribo, as well as many other delights I still purchase today were discovered. I didn’t know what to buy, so I of course bought everything. When I opened the first bag and ate the black wine gum, not knowing what to expect, it was like a totally new sense had been discovered. I’m not kidding. On the texture-these are wonderful- firm, yet spongy, not a lot of stickiness, a great chew. In the paradigm of wine gums, I’d certainly buy these before Maynards. Rowntrees Fruit Gums are a bit different, as they’re much tougher. I love those, but these are my new go-to jam. And as for the name “wine gums” – no, lush, there’s no alcohol in these-anymore. They were created in 1905 by mixing fermented wine with a gelling agent. Now? They just have words like “PORT” written on them so you can trick your mind into thinking you ‘re getting drunk off of candy. I’ve been meat drunk. But I’ve never been candy drunk. It’s just not possible. Best part? Got them at Cost Plus World Market! Worst part? They’ve been sold out now 3 times when I’ve gone back to get more. This could be a good thing or a sad, sad indication that they’re not carrying them any longer. Regardless, hunt these out. They’re delicious, they’re real, and they’re spectacular. Now, you see, I hate the black currant. I always want it to be grape, and it always lets me down. It tastes like grape mixed with tea that has gone off a bit. Black currant has been one of the things tha,t even after 10 years of living here, I just can’t get. I love the grape too. But the BC is the bomb! Great to see others into their sweets. 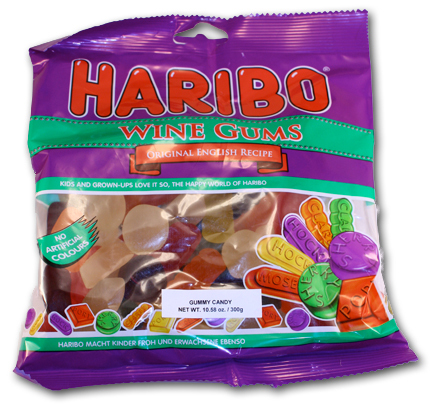 I just had to say that I am not into the Haribo Wine Gums. I so wanted to be but they just were too bland for me. The maynards are good, especially the sour ones (can’t find these anywhere in the UK). Just to make sure, I will ‘bag’ myself some more tomorrow to make sure!! I need to seek out this black currant you’re always talking about. I’m afraid I may have my expectations set too high though. Oh, I thought they were called Wine Gums because they had a sort of musty, wine/port taste to them, or at least the Maynards and Pascal ones I’ve tried have. Perhaps I’m eating drastically out of date lollies?